Chicken Nuggets are easy to make, cheap to buy and they taste great; but, are they a kind of food that you should turn to on regular basis? While chicken meat in general is very good for you, packed full of protein, Chicken Nuggets are often processed meat, meaning that it's nutritional value falls down the drain. Deep-frying them is the most popular method of preparation, which, in itself, is the least healthy method to prepare any meat dish. Boiled or baked, they are marginally better. While they do provide you with B-vitamins and protein, and are often served with a healthy salad, Chicken Nuggets often contain too much fat, oil and sodium, and are best taken in moderation - they're not good for your heart or for your waistline. 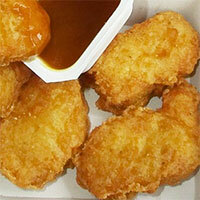 The calories in Chicken Nugget per 102.4g(5 pieces) is 219 calories. Chicken Nugget is calculated to be 214Cal per 100 grams making 80Cal equivalent to 37.38g with 18.2g of mostly protein、12.24g of fat、7.15g of carbohydrates in 102.4g while being rich in vitamins and minerals such as Niacin and Vitamin K.